Gliss Ultimate Color – Up to 10 weeks colour protection and a sensational shine. 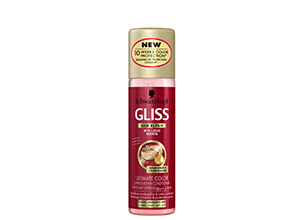 The unique Gliss technology repairs the hair with liquid hair components, from the roots down to the tips. UV filters protect coloured hair while leaving it healthy and nourished. I’ve been using this leave-in conditioner since I started with the complete Gliss Ultimate Color range, and have really been enjoying it. Sometimes I find that conditioners don’t make my hair as soft as I would like it to be, so by adding a leave-in treatment / conditioner afterwards, I can always ensure my hair is silky smooth. I spray this product through the lengths and tips of my hair (avoiding my scalp) and leave it in while my hair dries. I’m not entirely sure how much extra hydration / benefits it delivers, but the combination of this and the regular conditioner leaves my hair in a stunning condition. Frequent colouring ensures I almost always have split ends, but while using this product I find that my hair is so soft I barely notice them. It’s also a great product for anyone who is time-poor and skipped the conditioning step in the shower (however, I wouldn’t recommend doing it regularly). I’m loving this range from Schwarzkopf Gliss and would recommend it to anyone who colours their hair. My girlfriend uses this. She LOVES it!